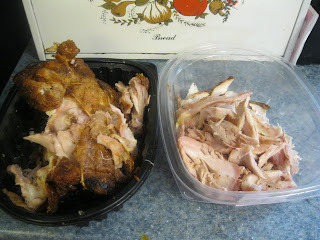 If you are like me you buy a rotisserie chicken from the store or wholesale club on a regular basis. 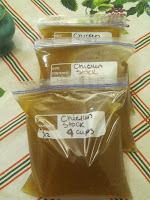 Before you throw out the carcass when you are done, you can use it to make anywhere from 1 1/2 to 3 qt.s of chicken stock for free. Even better, you can let your crock pot do the work for you! This is so easy, and money saving that you'll be mad at yourself for not doing it before. Store the stock in your freezer and use it for anything from soups to making a box of stuffing, mashed potatoes and more. Here's how to make the most of your rotisserie chicken. Start by picking apart any usable chicken meat that you can and storing it in a ziplock bag for a later use. Place all ingredients in a crock pot. cover with enough water to come within about 2 inches of the top of the crock pot. Mine is a 6 qt. crock pot but a smaller 4 qt. one will work also. Set crock pot to Low heat and cook for 6-8 hours. Jan's tip: Cook this overnight if you'll be home the next day, or store carcass overnight in fridge and cook the next day while you are at work. Make sure to get any little bits of broth or if stored in fridge overnight get all the gelatinized broth bits out of the plastic container the chicken came in and add to the crock pot. 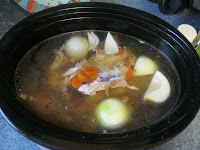 Remove carcass from crock pot and discard. 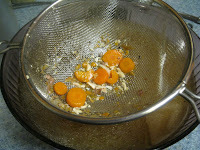 Pass the stock through a fine mesh strainer or a regular strainer that is lined with cheese cloth. Let broth cool before pouring into ziplock bags so the bags won't burst from the heat. Refrigerate stock up to 3 days or so or store in the freezer if not using it right away. 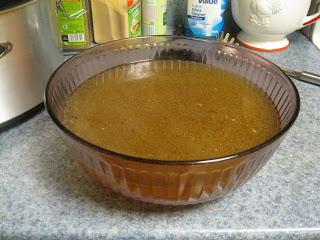 Remember that your cold stock will bring the chicken fat to the top and congeal it. Scrape it off with a spoon before cooking with the stock, to make it as fat free as possible. 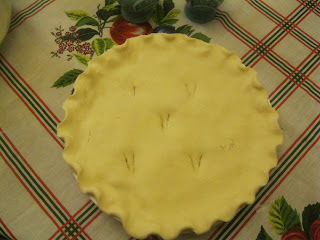 Jan's last tip: I actually had enough left over chicken that I decided to use the carrots, celery, and onions from the stock to make 2 chicken pot pies for the freezer.